Dr. Sue Klausmeyer is a composer, conductor and singer living in the Triangle area of North Carolina. She holds degrees in music from Meredith College and the University of North Carolina at Chapel Hill. She earned a Master of Music in Conducting from Westminster Choir College in Princeton, NJ, studying with Joseph Flummerfelt, Allen Crowell, and Frauke Haasemann; and she received a Doctorate of Musical Arts in Conducting from the University of Cincinnati College Conservatory of Music, where she studied with Earl Rivers and John Leman. She pursued additional studies in voice and Baroque performance practice at the Sweelinck Conservatory in Amsterdam, The Netherlands. During the summer of 1997 she was the recipient of a University of Cincinnati educational grant for advanced research in London, England on the choral manuscripts of Ralph Vaughan Williams. Professional activities have included church, university, and community conducting and membership in American Choral Directors Association, Chorus America, and the National Association of Teachers of Singing. Dr. Klausmeyer conducted the 60-voice UNC Women’s Glee Club from 2000-2018, leading them in campus and community performances as well as in a yearly winter tour along with the Men’s Glee Club. She organized, and for eleven years conducted, an annual event known as The Carolina Women’s Choral Showcase: Making Music, Making a Difference, an invitational concert and food drive for high school women’s ensembles held at the University of North Carolina in Chapel Hill. Beginning in 2000 she conducted VOICES, the Chapel Hill Chorus in choral/orchestral performances and was instrumental with them in board development, grant writing, and performing modern works with the group. In 2002 she initiated the VOICES Summer Chorus that performed in collaboration with the University United Methodist Church Concert Series. In 2006 she initiated a new vocal ensemble called Cantari, sponsored by VOICES and welcoming experienced singers from the community in addition to select members of the larger ensemble VOICES. She served as guest conductor of the Women’s Voices Chorus in 2007 and for a Treble Voices Festival held at NC State University. In 2003 she was selected as a conducting fellow for the Chorus America national convention in Kansas City, MI. where she conducted the Dale Warland Singers and the Kansas City Chorale. In 2008 she organized a summer touring choir known as the Carolina International Chorale. This choir traveled to Italy, Central Europe, Ireland, Spain and Scotland. Duke University Chapel. From 1998 to 2004 she conducted the Duke Vespers Ensemble, the Duke Divinity School Choir, the Duke Summer Choir, and assisted with the Duke Chapel Choir. 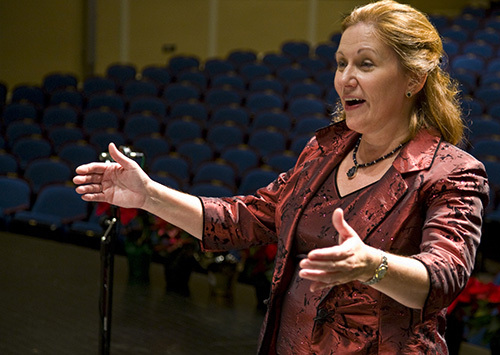 She produced numerous concerts at Duke Chapel including a 9/11 Memorial Concert that featured over 300 singers from community and university choruses, the NC Symphony, and was broadcast on local television. The Duke Vespers Ensemble performed concerts and recorded a CD entitled “Evening Echoes from the Memorial Chapel.” She led music workshops for pastors in the Duke Divinity School. Capital University in Columbus, Ohio. She conducted the Chapel Choir, the Choral Union, an alumni choir, and taught advanced conducting. She planned and conducted the Chapel Choir spring tour in mid-western states. Worthington Presbyterian Church. In addition to conducting the adult and children’s music programs she initiated the Celebration of Sound Concert Series, two new adult vocal ensembles – The Renaissance Singers and the Chamber Singers, and conducted three handbell choirs for teens through seniors. The University of Cincinnati. She conducted the Women’s Glee Club in an active program of concerts and tours, and the Cabaret Singers- a vocal jazz ensemble of sixteen singers. Binkley Baptist Church. She directed all adult and children’s music programs; conducted the premiere performance of “The Story of Ruth” and an innovative presentation of “Peace Child” which both including singers, actors, dancers and instrumentalists; accompanied and conducted massed choirs of elementary aged singers at the NC Baptist Children’s Music Camp at Caswell Beach; and worked with “Chime” a liturgical dance ensemble. Klausmeyer organized a women’s choral festival in Columbus, Ohio, and conducted workshops with high school students in Cincinnati, Ohio. She has adjudicated children’s and high school choral competitions and in the summer of 1996 she served as the assistant conductor of the Cincinnati International Chorale’s tour of Belgium, The Netherlands, and Germany. Dr. Klausmeyer performed as a mezzo-soprano with the Robert Shaw Festival Singers in Carnegie Hall appearances, as a soloist at the Spoleto Festival in Charleston, SC, and in Spoleto, Italy, with numerous early music groups, and in recitals. She sang with the Cantari Singers of Columbus and with the Vocal Arts Ensemble of Cincinnati.